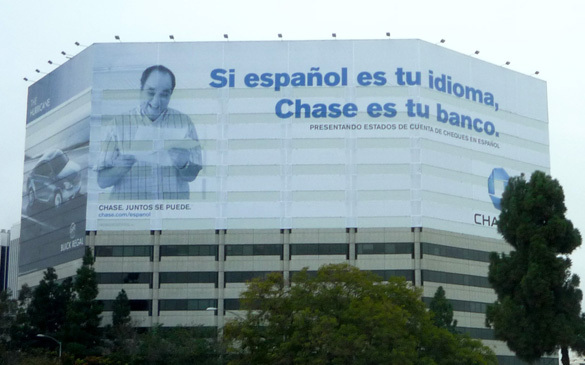 The Chase Bank ad pictured above, dominating the view on the southbound 405 Freeway near the LAX airport, was permitted last month by the city of Inglewood in exchange for 25% of the monthly revenue of $100,000 generated by the sign hung from two sides of a 12-story office building on La Cienega Blvd. That building, which is less than 100 ft. from the most heavily-trafficked freeway in Southern California, sits on the street that forms the Los Angeles city border. The sign owner is Skyposters, Inc., part of the corporate empire of Michael McNeilly, who went to federal court two years ago in an ultimately unsuccessful effort to overturn L.A.’s 2002 ban on supergraphic signs. Perhaps best known for his giant statue of liberty images and his widely-derided claim of being an artist unfairly persecuted by the city, McNeilly has apparently taken down his signs in the city of L.A., but is promoting a ballot initiative in the city of West Hollywood that would allow new supergraphic signs there as part of an ordinance levying a city tax on billboards and other off-site advertising signs. The city of Inglewood’s action allows supergraphic signs on all four sides of the building, plus an adjoining parking structure, up to 75% of the surface area, or slightly more than 54,000 sq. ft. Put in perspective, that is advertising space equivalent to 80 full-sized billboards. The other two sides of the building are now wrapped with an ad for Buick Regal. The city has also struck a deal with another sign company, New Jersey- based Pearl Media, to install supergraphic signs on an adjacent 13-story office building. A total of more than 92,000 sq. 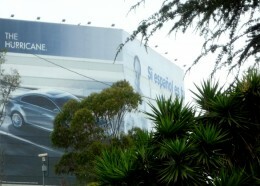 ft. of advertising space, or the equivalent of 136 billboards, would be allowed on the building and its parking structure. As of this writing, no signs had yet been installed. Inglewood’s residents are predominately African-American and Hispanic, and the median income is below that of the L.A. metropolitan area. So what’s wrong with the city finding some badly-needed sources of revenue to help support services such as police protection, garbage collection, and maintenance of public facilities like libraries and parks? For one, Chase Bank would never pay $100,000 a month to advertise on one of Inglewood’s commercial streets, given the size of the population, even though the ad targets a Spanish-speaking audience. But the fact that a stretch of traffic-packed freeway happens to lie just within the city limits allowed city officials to turn the public viewspace over to commercial advertisers who aren’t aiming their sales pitches just to the 112,000 residents of Inglewood, but to the more than 500,000 motorists who pass by on the freeway every day. In other words, those residents get the benefits from the revenue, while millions who live elsewhere only get an in-your-face exhortation to buy products and services. For another, the far side of the freeway is a residential neighborhood of small, single-family houses. The Chase Bank sign is clearly visible from most of the streets, as well as the grounds of a school, and it is brightly illuminated by an array of lights at night. Should people in their homes, students in their schools, and worshippers in their churches also be the audience for the ad campaign of a multi-billion dollar financial institution and a General Motors automobile? And supergraphic signs in general have raised questions that have never been adequately answered. What about the degradation of views of office tenants and workers? What about questions raised by fire officials over the covering of windows by these signs? However, the question likely to be answered most quickly will be the question of which one of the other small cities surrounding L.A. that have freeways within their city limits will be the next to give in to the blandishments of sign companies that lost their bid to dominate the L.A.’s skyline with their supergraphic signs?